I have this shirt. It's lovely but keep in mind it has to be dry cleaned! @curlyqmosaics, the $150 limit is on free shipping, not the 30% off. So, don't sit out on this deal yet! I love your blog - came across it through "In Honor of Design." This is such a great concept, and so accessible and helpful to many women who have love couture clothing but can't afford the pricetag. The design and layout is darling. Glad I ran across you! 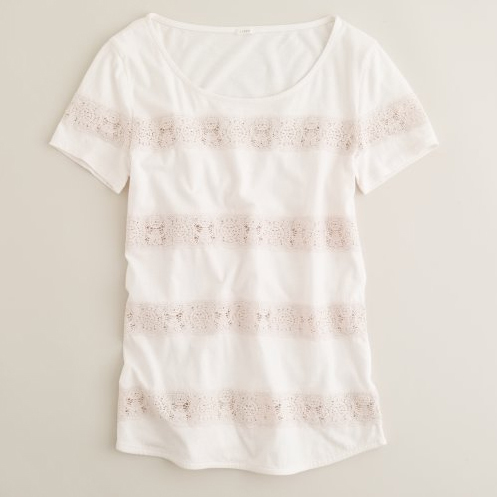 LOOOVE this tee, so pretty and fresh. great find! xoxo jcd:: enter to win my jewelry giveaway !! I'm sad to hear that it doesn't fit well on the body. It's way cute and such a great price for J. Crew!